Those of us of a certain age remember when dinosaurs were cold-blooded predecessors of reptiles, with tiny brains (or was it two tiny brains? ), scaly skin, clumsy gaits, and living solitary existences. Now, of course, we know that dinosaurs were warm blooded, rather intelligent, possessing colorful feathers, living in family units, and precursors to birds (well, the carnivores, at least). Anyway, a lot has changed in paleontology. One other area that has also seen significant changes in the landscape since the 1970s is the world of American soccer history. In the mid 1970s, the view was the North American Soccer League was the United States’ first attempt at major league soccer, and the U.S. prior to that consisted entirely of semi-professional ethnic clubs whose players were all immigrants. The 1930 U.S. World Cup team was made up entirely of “British pros,” and the 1950 U.S. team that upset England was also an all-immigrant side, with the goal scored by Larry Gaetjens. The only exception was St. Louis, where local kids actually played the game—and beat up on college kids who did not play soccer until they got to university. Otherwise, no American-born child ever kicked a ball until NASL teams held camps and introduced U.S. youngsters to the Beautiful Game in 1968. Today, of course, we know better: backed by the Philadelphia Phillies. By now, the original American Soccer League of the 1920s is fairly well-known to U.S. soccer fans, as are the teams (Bethlehem Steel, Fall River Marksmen) and players (Archie Stark, Billy Gonsalves, etc.) who were featured there. We also know the 1930 U.S. Cup team that took 3rd place in the inaugural tournament was made up primarily of native-born players from the ASL, including Fall River, Massachusetts native Bert Patenaude, scorer of the first hat trick in World Cup history. We now know the 1950 U.S. team was primarily made up of players born in the U.S.—and that, while the goal scorer may have been foreign born, his name was “Joe.” And, finally, we now know that—throughout the 1940s, 1950s, and 1960s—native born Americans—many of whom were from Philadelphia—starred in the second version of the American Soccer League. For all of this progress, however, there are still gaps in our soccer history. Also, with so many of these revelations of recent vintage, some important items can get lost in the shuffle. It is with this long introduction that we want to shed some light on the North American Soccer Football League—the U.S.’s second (or third, if you count the very short-lived attempt in 1894) attempt at a professional soccer league that expanded beyond the New York or St. Louis area, and the first to go “international” by including teams from Canada. With the end of World War II, there was suddenly an abundance of quality soccer players returning from active military duty. The prevailing wisdom at the time was that returning GIs who had been exposed to the game in Europe would come home as fans of what was even then known as the “World’s Game.” Also, with the post-war boom in interest in sports, a number of savvy businessmen wanted to get in on the ground floor of professional soccer, a sport that drew significant crowds in Europe and did not have anywhere near the overhead costs of professional baseball or American football. One such businessman was Ferdinand Weiszmann, himself a former player, and owner of the successful Chicago Maroons club of that city’s National Soccer League. Weiszmann initially applied for membership in the American Soccer League for the 1946-47 season. The ASL was still a primarily New York/Philadelphia area league at that point, and was not eager to incur the travel costs needed to play in such distant lands as Chicago. Instead, the league suggested he establish a Midwest division for the ASL. Weiszmann thanked them for the advice, and decided to go one step further. As he himself would later explain to an unnamed Associated Press reporter, Weiszmann noticed the large crowds drawn by the National Hockey League in Midwest cities like Detroit and Chicago, even though the teams were made up entirely of foreigners (i.e., Canadians). Figuring fans would support soccer teams made up of foreigners just as fervently, he established the North American Soccer Football League (NASFL), with play to begin in the summer of 1946. 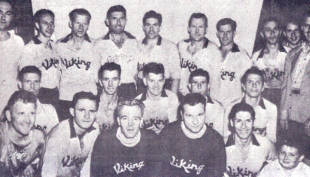 Joining the Maroons were the team’s cross-town rivals in the National Soccer League, the Chicago Vikings—as winners of the Peter J. Peel Cup, the Illinois champions in 1945. Also joining were Detroit Wolverines (initially called “Tigers”). Adding further credibility to the new circuit was the addition of Pittsburgh Strassers, a club that won the National Amateur Challenge Cup in 1940 and 1943, and were runners-up in 1944. Rounding out the league was Toronto Greenbacks; initially the John Inglis Club from that city wanted to participate, but were denied permission by the Canadian Soccer Association. The NASFL sought to be “big league,” and made arrangements to play their matches in major league facilities: for example, the Maroons played at Wrigley Field, the Vikings established Comiskey Park as their home ground, and Detroit played home matches at University of Detroit Stadium. The initial 1946 season found the teams playing an 8-game schedule, facing each other twice. Detroit Wolverines won the regular season crown, led by league-leading scorer Gil Heron. Heron’s 15 goals made up over half of the team’s 29 goals that year, and the Jamaican-born, Canadian-bred striker quickly established himself as the league’s most exciting player. The 24-year old was also a bit of a pioneer, being one of the first black players in American professional soccer. Heron came down from Canada to play for Detroit, first with Detroit Corinthians and then the Wolverines. 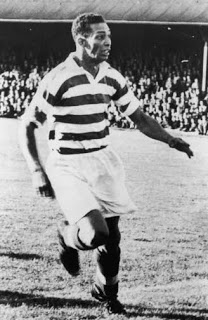 Gil Heron during his brief tenure with Glasgow Celtic. Pittsburgh struggled through the season with 3 wins and 5 losses, but featured a locally born star. Nicholas DiOrio was born in Morgan Township, PA, and starred as a forward with the Strassers for a number of years. He was a member of the 1950 World Cup team, although he did not play the day the Americans shocked England; along with the rest of that team, he was inducted into the U.S. Soccer Hall of Fame in 1976. Although DiOrio did not score many goals in 1946, he did help teammate Harry Pitchok finish second in the league in goals with 7. Chicago Vikings also proved to be a major disappointment in the league, notwithstanding the exploits of Roscoe Anderson and his 7 goals. The Vikings were able to take some solace, however, from the fact that they won the U.S. Open Cup that year, defeating Ponta Delgada of Fall River. The league final saw champion Detroit face off against runner-up Toronto. The Greenbacks, led by scoring duo Harry Phillips and Freddy McCusker, upset the Wolverines 3-0 to be crowned league champions. While the quality of play on the pitch was impressive, the clubs did not fare so well as the gate. Crowds were in the 1,500 to 3,000 range—larger than most amateur or semi-pro leagues, but nowhere near enough to support professional salaries and the rental fees of major league stadiums. Nevertheless, the league endeavored to persevere into a second season. Weiszmann, for his part, stepped down as league president to concentrate on improving his Maroons side for 1947. Leslie O’Connor, Vice President and General Manager of the Chicago White Sox, took over as NASFL President. Notwithstanding the prior season’s difficulties, the NASFL managed to expand in 1947, adding St. Louis Raiders to the lineup. The league planned to play a split season, with each half made up of 10 games. The circuit also announced that it would spare no expense in attracting top talent. The 1947 St Louis Raiders. Photo Courtesy of Webster University. With the first half beginning in April, fans were treated to some entertaining soccer. Pittsburgh—despite losing Nick DiOrio in the off-season to Chicago Vikings—relied on goal scoring from Felix Mitchell and solid defending from South Fayette Township, PA native Paul Danilo to lead the circuit in the first half. Toronto again finished in second, with Phillips still scoring goals, and the all-American St. Louis Raiders (coached by future Hall of Famer Werner Nilsen) finished tied on points (but third because of win differential), thanks to having the top two scorers in the league, Harold Gunning (7 goals) and Arnie Muntz (6 goals). Gil Heron netted 4 goals with Detroit. However, major financial problems were effecting the league, with high travel costs a significant factor (which was ironic given the concerns of the ASL that led to the formation of the NASFL in the first place). To make matters worse, a power struggle erupted among league administrators. When it became known that Weiszmann’s spending spree resulted in the Maroons operating at a $75,000 deficit, play was temporarily suspended around the league to allow teams to get their financial houses in order. Eventually, the first half was completed. Oddly, as this was only the first half of a planned two part season, there was yet another playoff—this time, however, the regular season champion held on to win the crown, with Pittsburgh defeating Toronto in a two-leg series. At this point, the league was in a state of chaos. The second half was to begin in September, with 6 games played through September and October. However, the aforementioned power struggle meant that no one was sure who was running what league. For instance, Pittsburgh newspapers said the league had been renamed the American Professional Soccer League. Meanwhile, the two Chicago teams dropped out, but were supposed to be replaced by a new team—Chicago Tornadoes—made up of the best players from the Vikings and Maroons. It appears a few games were actually played—including some games in July and August which were to count in the standings. However, Detroit never fielded a team, and the whole thing collapsed abruptly. Vestiges of the NASFL remain. The Maroons and Vikings still exist, and the Raiders became an amateur squad, joining the St. Louis Major League and eventually evolving into national amateur power Kutis, a club that still exists today. Gil Heron went on to make a name for himself. 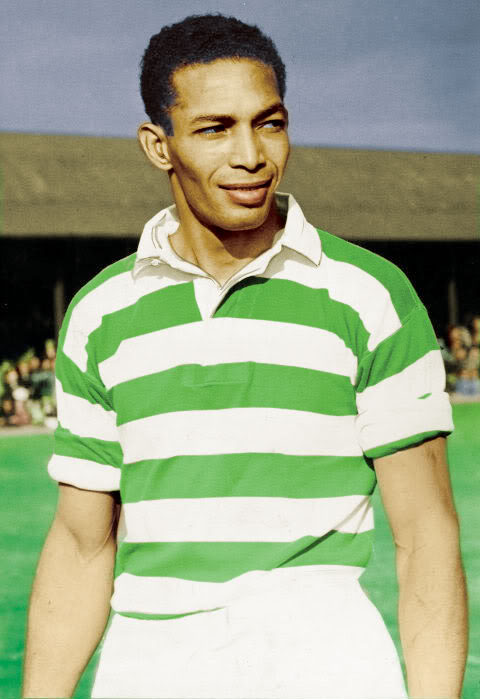 Spotted by a scout from Celtic while the storied Scottish club was touring North America, Heron was signed as the first black player for the Glasgow side in 1951, scoring in his debut with the club in a League Cup match. He made three other Cup appearances, scoring twice and earning the nicknames “Black Arrow” and “Black Flash,” but only appeared in one league match before being released. Heron then latched on with Third Lanark, where once again he proved productive in Cup matches (5 goals in 7 games), but did not see any action in league play. After a brief sojourn with lower-level English league side Kidderminster Harriers, Heron returned to Detroit to rejoin Corinthians. He later moved back to Canada, where he became involved in African-Canadian politics. Ultimately, the NASFL was a good idea, but poorly executed. Shockingly, the lessons of its demise were largely ignored 20 years later with the arrival of the two leagues that would become the North American Soccer League, but it can safely be said that Major League Soccer has avoided these pitfalls. In any event, the largely-overlooked NASFL is worthy of mention.